Lesson 1: Who is Jane Austen? Essential Questions: How does what we have read or experienced in the past influence us as we read something new? Objective: Students will develop an understanding of the social complexities of Georgian England and understand how characters function in this social context. Standard: CCSS.ELA-Literacy.RL.11-12.5 Analyze how an author’s choices concerning how to structure specific parts of a text (e.g., the choice of where to begin or end a story, the choice to provide a comedic or tragic resolution) contribute to its overall structure and meaning as well as its aesthetic impact. Rationale: Analyzing author choice in the first few chapters of Volume I will allow students to enter into Austen’s world and the world of Northanger Abbey. Students will be able to make connections between how the story’s structure and aesthetic contribute to its parodic tone, and how characters are navigating the complex social world. Standard: CCSS.ELA-Literacy.W.11-12.7 Conduct short as well as more sustained research projects to answer a question (including a self-generated question) or solve a problem; narrow or broaden the inquiry when appropriate; synthesize multiple sources on the subject, demonstrating understanding of the subject under investigation. Rationale: Students will practice conducting short research projects by investigating an area of Georgian/Regency Era culture. Students will develop a greater cultural understanding of the social complexities of Georgian and Regency Era England. The teacher may use Chapter II of the digital text located at The Text of Northanger Abbey.org to demonstrate and introduce the CommentPress software to students. This may be done by listing your own annotations, or using some of the example annotations provided. Students should annotate chapters using the CommentPress software with questions and observations that they may have as they are reading. These questions can be used to gauge what students are interested in about the text, and where more guided instruction is needed. In other words, the teacher may use student comments as a method of formative assessment. Encourage students to respond to their peers’ questions and comments as they are reading. The discussions that take place away from the classroom space will enhance student learning and provided points of discussion during class time. Students will gain a deeper understanding of the text and the social world that Jane Austen is writing on if they can fully visualize the time, place, and characters of Northanger Abbey. In order to enhance student perceptions of the work, students may develop small group presentations on aspects of Georgian culture that can be found within the first few chapters of the text. To give students ideas for topics, the teacher may show a virtual tour of the Pump Room in Bath, or a video depicting English Country dancing (from the BBC’s 1995 mini-series of Pride and Prejudice). The teacher may also provide students with a list of resources, such as the Social Customs During the Regency Era list from Jane Austen’s World which lists, alphabetically, everything from agriculture to vocabulary. Students may then get into small groups and brainstorm topics that they wish to pursue, and how they would like to present their topic. If students choose dancing or music, encourage a live performance; if they choose travel, encourage students to show historic maps depicting different travel routes, etc. At this time, the teacher may wish to introduce character logs, in which students document and keep track of the different characters that appear within the novel. A few characters are introduced rather quickly in the beginning of the novel, so students may find it helpful to keep a log of character descriptions and notable events related to them so as to better understand the text. This will also help students track character development, important events, etc. One helpful resource for understanding and visualizing who characters are and how they relate to one another is the Characters page from pbs.org. 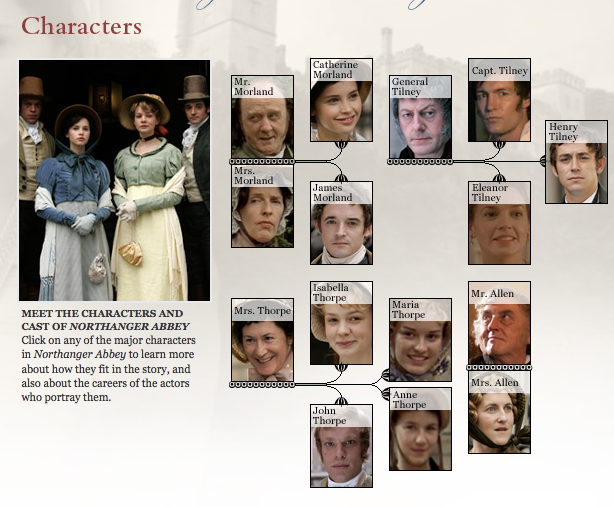 The Masterpiece adaptation of Northanger Abbey provides a character web on this page showing the relation between characters and provides a face for each student to associate with each character. Clicking on each character’s picture within the web will bring up a brief description of the character. This tweet was produced using a generator at Simitator.com, which can also simulate Facebook statuses in addition to Tweets. Tweets are downloaded as a JPEG image after making them so students may print them, send them electronically to the teacher, or post them on a class website. Students may each choose a character to follow throughout the novel, or the teacher may assign roles to groups of students.